Agilent Technologies introduces a new range of wideband MIMO PXI vector signal analyzers that deliver high bandwidth signal analysis. Specifically designed for flexibility and growth, the wideband MIMO PXI vector signal analyzers are ideal for customers requiring 80 + 80-MHz SISO, and 80-MHz or 160-MHz MIMO 802.11ac measurements. The analyzer also provides 780-MHz analysis bandwidth to address future wireless standards. The new analyzer enables R&D and test engineers to validate their MIMO 802.11ac designs with a unique combination of accuracy, speed, bandwidth and scalability in a small form factor. The wideband MIMO PXI vector signal analyzers consist of Agilent's M9362A-D01 4-channel down converter, M9202A 12-bit digitizer, M9302A LO, M9168C RF attenuator, and M9352A IF amplifier/attenuator modules for one to four measurement channels. 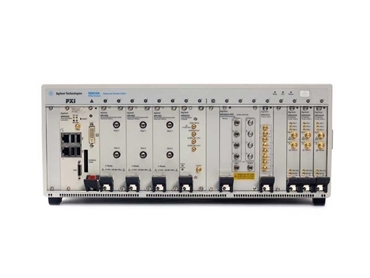 According to Mark Pierpoint, VP and general manager of Agilent's Software and Modular Solutions Division, the new wideband, multichannel instrument has been equipped with new broadband modulation, MIMO schemes and electronic beam forming to address test challenges in the design and validation phases of a project. The two-channel wideband MIMO PXI vector signal analyzer is available now. Multichannel analysis capability for the M9362A-D01 is available through a free download of the M9202A software. Agilent offers a complete line-up of PXI and AXIe products including digitizers, arbitrary waveform generators, digitizing oscilloscopes, digital multimeters and a range of switches.